Do you ever find you want to mix together music from two different sources, but can't do it because your mixer can only take one type of input? Well, now you can. The DJ2PB is a two channel mixer that takes input from modern storage media including MP3 players, memory sticks, iPods, and SD memory cards. 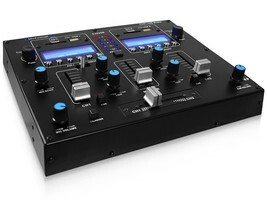 The unique benefit of this mixer is its dual USB and AUX inputs and bluetooth– the AUX lets you use your iPhone as the second source. You can mix completely without any CD players or computers. As well as two USB ports and two SD card slots, the mixer has two sets of RCA sockets and an 1/8 inch AUX connector. Its output is to a set of RCA cables, so you would also need an amplifier to connect through to speakers. Other sockets on the main console are a ¼ inch microphone socket and a ¼ inch headphone output socket. The controls for each input include repeat and random playback options and there is a folder/track browsing knob to help you get to your desired track on the storage medium quickly. Each of those storage devices can have a capacity of 32 gigabytes and the music should be stored in the MP3 and WMA formats. There are silver buttons operating standard music playback controls beneath a display showing track details for each channel. Other controls for each channel are cue, bass, treble and volume dials. You can synch the beats of two sources by following the LED sound meter for each channel. Most importantly for a DJ mixing table, there is an easy-to-use crossfader on the unit. There is a microphone talk over switch and separate volume and echo controls for the mic, and independent headphone volume controls. This compact mixer benefits from the innovative design and tough materials that are the signature features of Technical Pro's professional sound equipment range.